Surprisingly, Stugis is a darling little town. The owner of the campground says they have a population of about 4,700 people but that for two weeks in the summer, they swell to about a million. Because this is their 70th anniversary, they may have more than that this year. I can not imagine dealing with that many people. Just the porta potties alone would be too much! They have several businesses that are huge - and just open 2 weeks a year. If I lived here full time, I believe I'd be putting plywood over my windows, barring the door and heading out of town a week or two before the big rally begins. We are testing the water-tightness of the tent tonight as we are in the middle of a thunderstorm. Getting a few drips on my computer screen - grrrrr..... Oops - and Arayo has gotten wet from laying against the side of the tent. NOT good signs. Photo: Arayo wasn't allowed to visit Devil's Tower yesterday. All animals must stay in the car and it was simply too warm for that, so we drove around the outer perimeter. 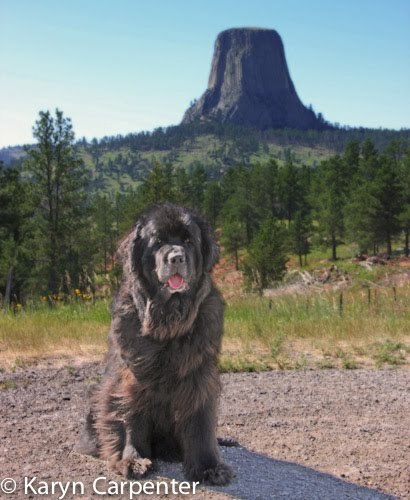 Nice pic of Arayo and Devil's Tower! Enjoy Sturgis! I love all the pictures of Arayo in front of state signs and monuments! I think we all need to write letters to Devil's Tower and demand an air conditioned waiting room for our best friends. I have a friend who lives in a small town just outside Sturgis - pop 5. (Her family and the guy who owns the bar.) Her experience with the bikers has been mostly positive. This shot looks handpainted. Arayo has the most cooperative hair.